The Argument: Is Fenceline Spraying Important? For many years there has never been an exact answer about whether fenceline spraying is needed or not. After gathering a lot of feedback, I have come to a conclusion. To gather everything I learnt, I decided to lay out the information from both sides of the argument. Yes, it is important: Too much tall grass or weeds touching an electric fence will cause a drain. The charge will eventually cause a "burned" place in the vegetation. It looks a lot neater if your fences are clear from weeds. It is also easier to repair a fence if you don't have to remove a bunch of weeds before you get to the wires. No, it isn't important: If you're spraying fencelines with Roundup®, it seems like a losing battle. Its best to leave the brome grass, etc. intact. A thick presence of grass will outcompete any other weeds. If you kill the grass, you will get all sorts of problems. Anytime you have bare ground, something is going to try to grow there. Conclusion: Fenceline spraying is a task that should happen on your farm or ranch but using the right chemical is key. If you are wanting grass to stay and weeds to go, Roundup® is probably too strong. If your fences are electric, Roundup® is your best option as you don't want any growth getting near your fences. Read the below tips to learn more about how you can make fenceline spraying simple. Don't spray on windy days - What is your neighboring crop? While spraying on windy days can make your spraying inaccurate, it can also be dangerous. If you are spraying fence rows next to a sensitive crop, the chemical you use could affect its growth dramatically. Below is a good video that will help you understand why not to spray on windy days. Use the right chemical - Choosing the right chemical will depend on what your neighboring crop is, what type of fenceposts you have and whether you have an electric fence or not. To view the latest on what chemical to use, watch the video below. Pro tip: If you have metal posts, Roundup® could make them rust after a few sprays. However, if you want to kill all grass and weeds below your fence, Roundup® is your best option. Use a boomless nozzle - The reason a boomless nozzle is so affective for fenceline spraying is because of its accuracy. Because of the way it sprays, it allows you to travel close to the fence while applying a good amount of liquid on your fence rows. It is also extremely effortless. You just switch on your pump and your set to spray. Interesting fact: Boomless nozzles can spray up to 15'. This gives you great coverage. 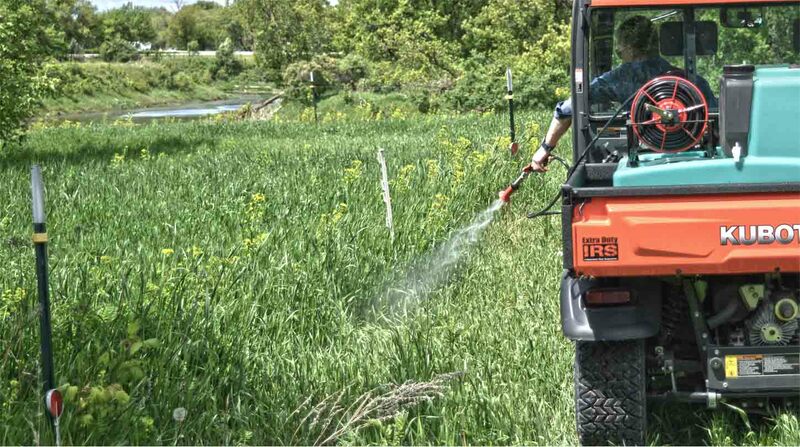 Use a sprayer that is easy to clean - If you have to spray weeds and then grass, you may be changing your chemical. Having a spray tank that is easy to drain with a sump is a must. This will allow you to rinse without mixing chemicals. Although there are other fenceline spraying techniques, these simple tips will help you save more time and spray more efficiently. From my research, it appears that having a good sprayer and using the right chemicals are the key things to get right. If you have any question about these tips or have a tip to add to the list, comment below.